SEATTLE – Washington’s zone defense changed the tone at the start of the second half and freshman Jaylen Nowell took care of the offense down the stretch. 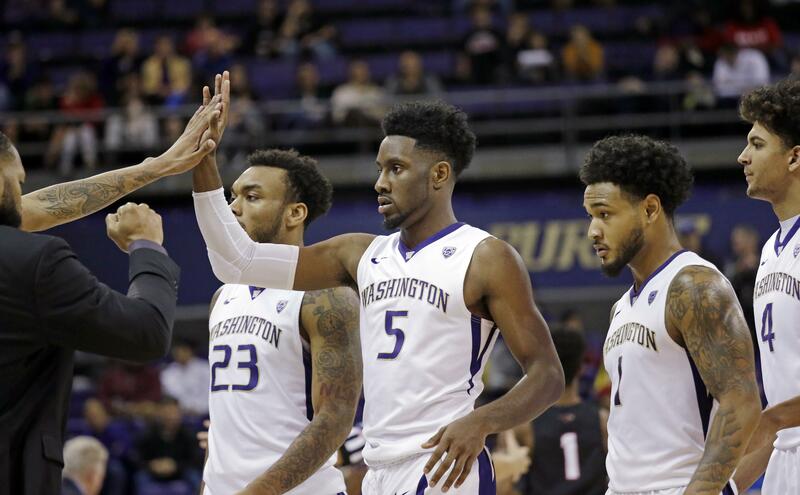 Nowell scored 11 of his 21 points in the final six minutes and Noah Dickerson added 18 points and 11 rebounds as Washington held off UC Davis 77-70 on Sunday night. UC Davis rallied from a nine-point deficit to go in front 57-55 on Joe Mooney’s 3-pointer, but the Huskies answered with a 9-2 run, going in front 64-59 on Matisse Thybulle’s layup with 4:44 remaining. Garrison Goode’s layup brought the Aggies within 67-65 with 1:52 left. Nowell scored on back-to-back possessions to push the lead to 71-66 and Washington made 6-of-6 free throws from there to seal it. Nowell made 7 of 12 shots, made all six free-throw attempts and added six rebounds to help the Huskies to 40-25 advantage on the boards. Dickerson had 18 points and 11 rebounds, David Crisp added 13 points and Thybulle scored 11 for the Huskies (4-2). Chima Moneke had 23 points and Siler Schneider added 15 for the Aggies (3-2). UC Davis entered shooting 44 percent from 3-point range, but was just 5 of 21 against Washington’s zone, which Hopkins brought with him after 22 years as an assistant at Syracuse. Washington erased a 37-34 halftime deficit with a 14-2 run to open the second half. The Aggies shot 50 percent in the first half, but on their first eight possessions after the break, they missed four shots, including two 3-point attempts, committed two turnovers and missed 2 of 4 free throws. The Aggies offset poor long-range shooting early against Washington’s zone by getting to the free-throw line for a three-point halftime lead. UC Davis was just 1 of 5 beyond the arc, but was 10 of 12 from the line. Moneke had 13 first-half points for the Aggies. Washington held a 17-11 rebound advantage in the first half, including seven offensive boards, but also committed 10 turnovers. Published: Nov. 26, 2017, 9:18 p.m.